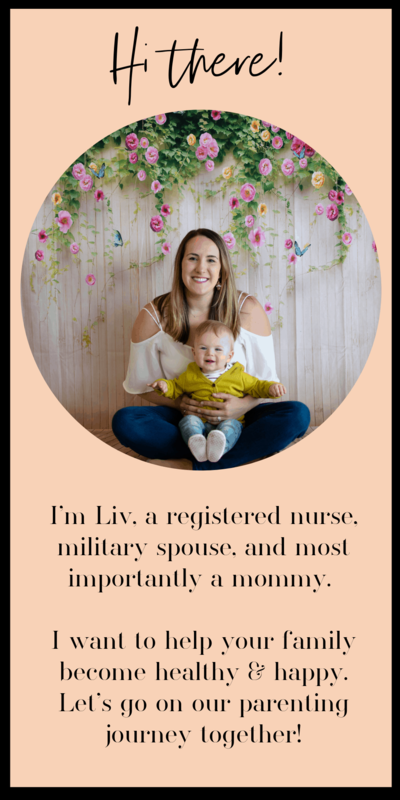 I started making DIY baby lotion about 4 months after my son was born. I noticed that he kept having these little red bumps all over his skin. At first I thought this was just newborn stuff or my hormones still working their way out of his body. After 4 months the bumps did not go away, so I figured he must be reacting to something I was putting on his skin. I try my best to use natural baby moisturizers and minimize exposing him to harmful chemicals and dyes. As it turns out, even lotions that are marketed as “safe, natural, and organic” have some unwanted additives, fillers, and toxic preservative chemicals. I don’t know about you, but I grow tired of researching every little ingredient on the label of these so-called organic lotions, but I DO have 5 minutes to make my own baby lotion! We earn commissions through our links. Please read our full disclosure here. It’s kinda silly but I get a lot more joy out of using things I have DIYed over the store bought stuff. I give my son baths and find it so satisfying to unscrew to MY jar of baby lotion and rub the buttery goodness all over his little body. I know it is nourishing and soothing his skin because the only ingredients are food and love. You will need either a hand mixer or stand mixer for this recipe. Add the 1/2 cup of shea butter to a bowl and whip it on high for about a minute. You want to get as much of the lumps out as possible. Then add the 1/4 cup of coconut oil, 1 tbsp of sweet almond oil, and 1 tbsp of aloe vera gel to the bowl and whip for another 30 seconds on high. Use a spatula to scrape down the sides and then mix on medium while you add the drops of essential oils. 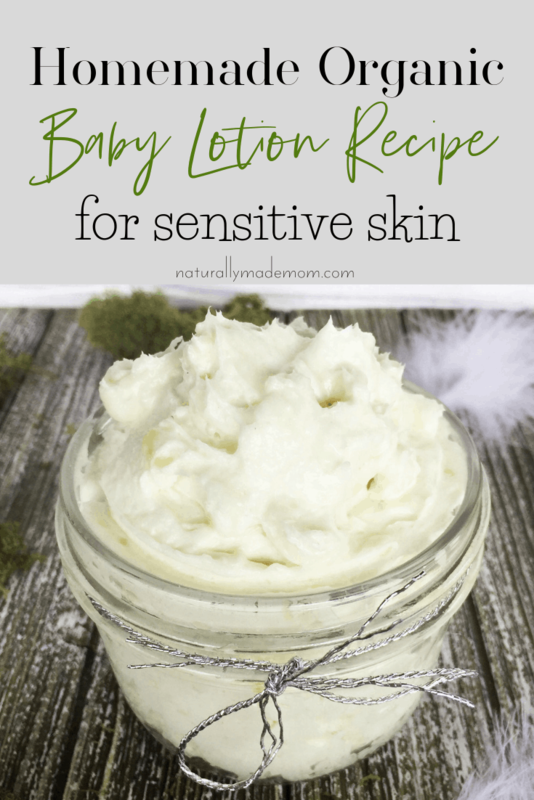 I have found that beating the ingredients on high will get this DIY baby lotion incorporated enough to serve the purpose of having non-toxic, nourishing baby lotion on hand. If you are short on time, use this method to make your baby lotion because it only takes about 5 minutes. If you want a smoother consistency, you will need to proceed to the next method which uses a double boiler. If you find that you aren’t getting the consistency you desire, you may want to use a double boiler to melt the shea butter and coconut oil together first. Once the shea butter and coconut oil are fully dissolved, remove the bowl from the heat and transfer the ingredients into your mixer bowl. Allow to cool for around 5 minutes. Then add the remaining ingredients and mix well. **It will take some time for this lotion to harden back up, so don’t be alarmed if it stays in a liquid consistency for a while. Once the baby lotion has completely cooled and hardened, beat on high for 30 seconds to make a fluffy consistency. It helps to place it in the fridge to speed the hardening process. You now have some amazing DIY baby lotion that your baby will love! Your homemade baby lotion can be stored at room temperature for up to 3 months or in the fridge for up to 6 months. We use this lotion after every bath or any other time my son’s skin feels dry. Side note: you don’t need to wash your baby with soap more often then once a week. Pre-puberty, children do not produce enough natural oils and using soap more often than that will strip them of their natural bacteria and oils. We want to promote a healthy skin microbiome on our children. You can still allow them to enjoy a bath everyday if that relaxes them, just don’t use soap. A little water and friction will take off the dirt from playing outside. It is extremely beneficial for children to play in dirt! It replenishes our normal flora and rebalances our energy that is constantly getting disturbed from all the wifi we are constantly around. Make sure to lather on your DIY lotion after every bath! I didn’t want to leave the post without explaining my rationale for the ingredients chosen in this recipe. Each ingredient is carefully selected for purity and lack of chemical additives. I chose to place my rational after the recipe for those who don’t care as much for the science behind it all and just want to make a fun and nourishing baby moisturizer! Shea butter comes from the seeds of the African Shea tree. These seeds are rich in important vitamins such as vitamin A, E and F and also offers natural UV protection (about SPF 6). Shea butter is rich essential fatty acids which is absorbed by the skin and assists with healthy cell turnover and collagen production. 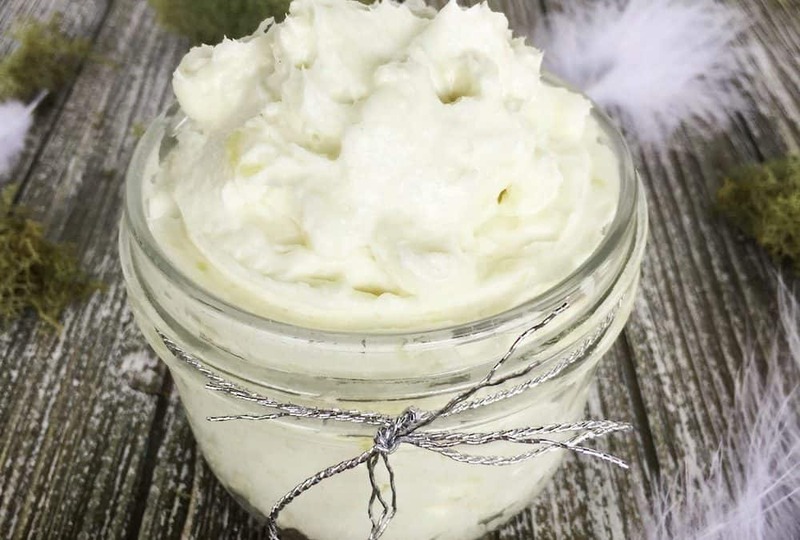 The best part about shea butter is its buttery consistency, which is why it is a perfect base for homemade body butters and baby lotions. In the end doesn’t it always come back to coconut oil? I just love how versatile this stuff is which is why I usually buy my coconut oil in bulk. Coconut oil is an excellent carrier oil for essential oils, which means it helps your skin absorb the medicinal qualities of essential oils better. Coconut oil is one of the most well researched superfoods and is such a versatile ingredient there is no way not to include it in any topical recipe for babies. It is gentle and nourishing to the skin, as well as antifungal. And we definitely want to fight fungal overgrowth around our sweet little ones diaper area! I’d say that if aloe was good enough for the Pharaoh it is good enough for my family! I love using cedarwood essential oil due to it’s calming forest scent. It is great for baby lotions being used before bed because it helps to calm the mind and help your baby sleep through the night. I add Lavender essential oil to my DIY baby lotion for its high antioxidant properties. Lavender essential oil is also very calming and helps to reduce anxiety and induce sleep. This is good news for exhausted mamas who will also receive the benefits on their hands from applying lotion to babies. How do you make your own baby lotions? I hope you enjoy this nourishing DIY baby lotion as much as my little man does! Let me know what you think and don’t forget to share! If you are a fellow DIYer like me then you may also want to try my homemade baby wipe recipe too!